Arashiyama is a bit of a romantic destination and it’s a great example of picture-perfect, traditional Japan. You’ll often see people dressed in kimono walking through the small alleyways and rickshaws running past carrying customers. While there are a few temples and other points of interest, such as the Bamboo Grove, what I love most about Arashiyama are all of its small shops. The main road is lined with small, family-run stores, all which add a certain charm to the city. Small boutique stores, souvenir shops and plenty of delicious restaurants- Arashiyama has it all. One of my favorite things to do while in Arashiyama is to spend the day browsing the stores, followed by sitting down to enjoy delicious traditional sweets. Most shops may only seat around 10 people, but if you arrive later in the evening, you should have no problem getting a seat. Upon sitting down we were given a few minutes to look over the menus, but we had already made our choices. I ordered anmitsu (あんみつ), a very popular, traditional dessert. It is made of small cubes of agar jelly, a white translucent jelly made from red algae or seaweed. 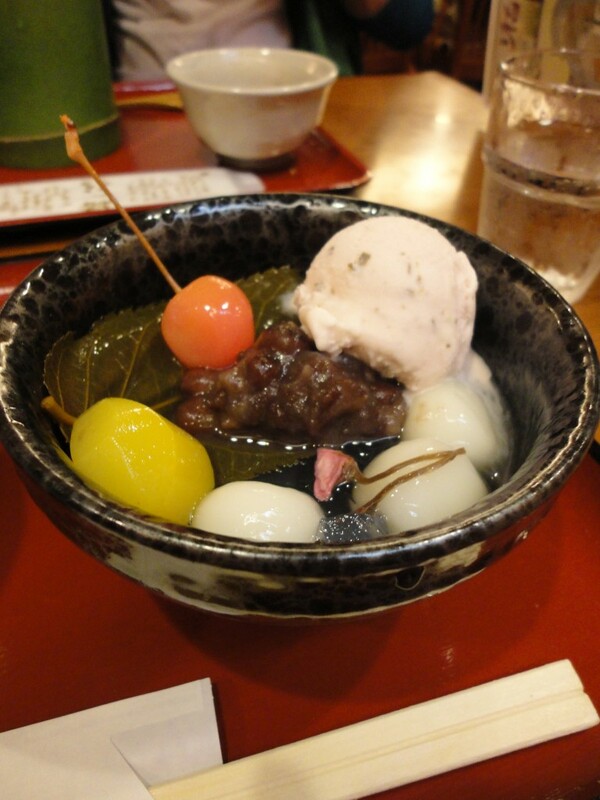 It is served in a bowl with sweet azuki bean paste or anko (the “an” part of anmitsu), mochi balls, and a variety of fruits such as peach slices, oranges, lemons, and cherries. The anmitsu usually comes with a small pot of sweet syrup, like honey, called mitsu (which refers to the “mitsu” part of anmitsu), which is poured onto the jelly before eating. For more modern variations, ice cream is often added to the top! My order, picture below, did come with a scoop of cherry ice cream. Delicious! 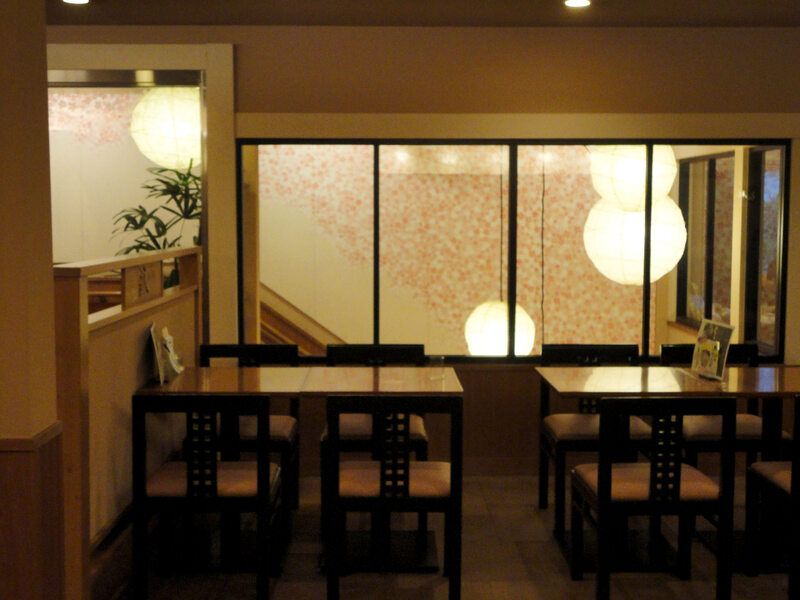 There are a few different variations of anmitsu, with different ingredients being used. 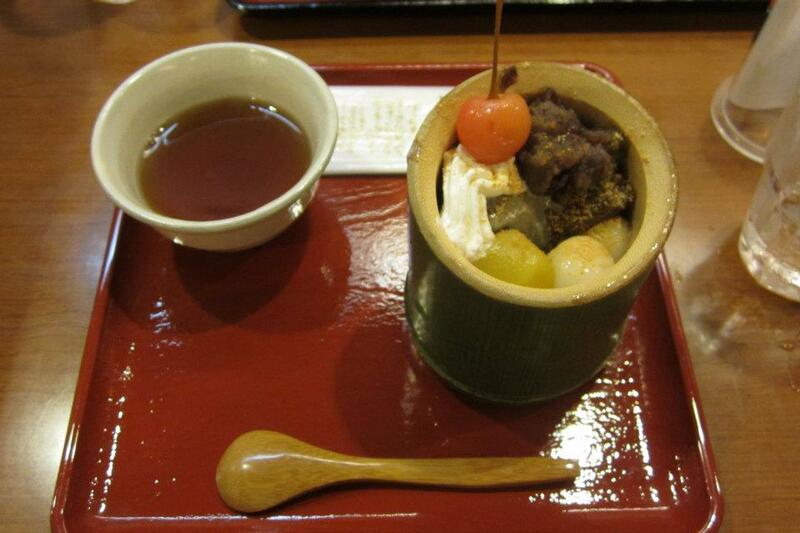 The original dessert is actually called mitsumame, which has beans mixed in. Another friend who was with us at the restaurant ordered mitsumame, which had kinako, soy bean powder, mixed in his. The jelly in my dessert was served in the form of long noodles, whereas his were the more traditional cubes of jelly. 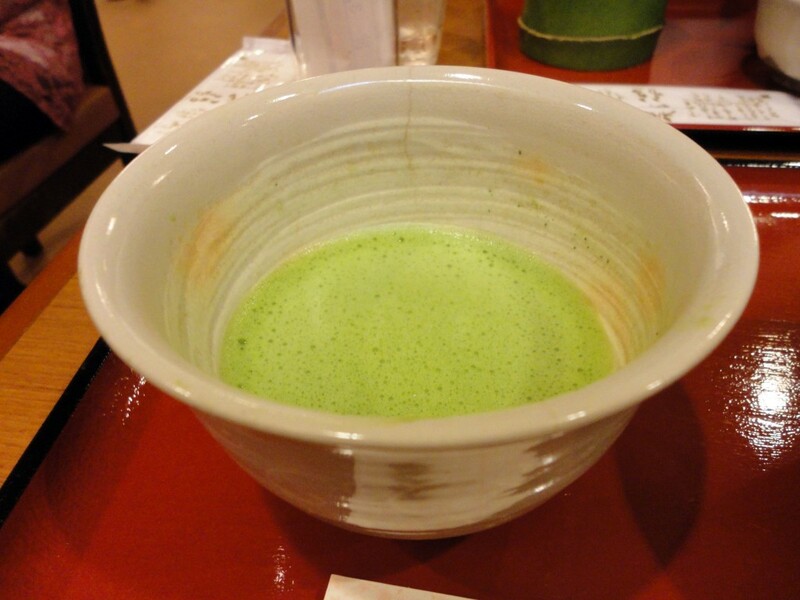 Of course no traditional sweets are complete without a cup of matcha, green tea. As we finished our desserts, the waitress brought our tea out. The temperature and consistency of the tea was perfect, a great way to end our dessert session. While there are many popular Westernized desserts in Japan like parfaits and ice cream sundaes, be sure to try some traditional Japanese desserts as well! Although they might look or sound weird, they’re delicious in their own way.